My heart races every time I enter salt-water. As my head sinks below the surface, the mammalian diving reflex kicks in and my chest slows to match the beat of the waves gently crashing overhead. Whatever emotions I had felt until this moment have faded into the endless blue. The descent gives me a few moments to gather my thoughts before I turn 180 degrees and gently levitate just centimeters from the ocean floor. My experiences in the ocean are what define me as an individual. The ocean has shaped my identity in a unique way despite my distance from it here in landlocked, arid New Delhi. 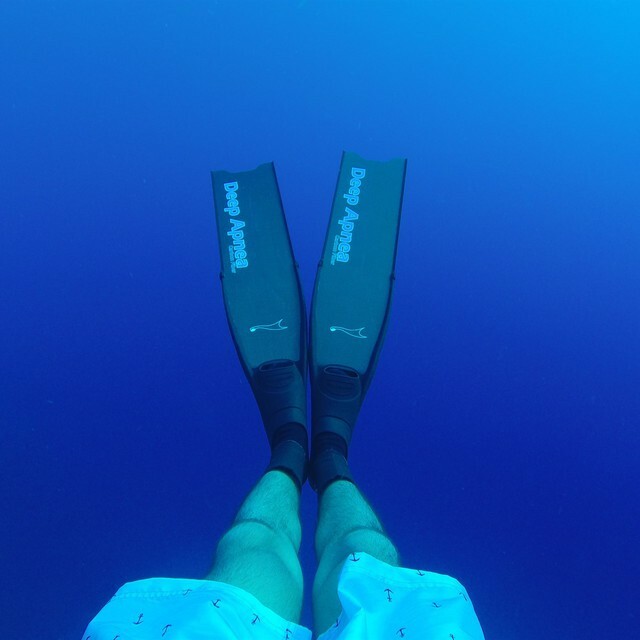 Free-diving, the art of holding one's breath and descending underwater, has taught me a great deal about both the subaquatic world and also myself. The sport has allowed me to explore my limits underwater; the ocean has taught me to overcome them. An unborn baby's amniotic fluid has a similar saline content to seawater. So diving is like a return. In the words of John F. Kennedy, "We all came from the sea". And I believe that some of us are destined to keep going back for the durations of our lives. I respect the ocean. I don't touch corals, or harass fish. Sometimes while diving there is a moment when I forget how long I've been underwater. The fish suddenly don't fear me; they rise from within cracks of coral, acknowledge my presence, and continue their days. The reef accepts me as part of it. This is something I live and strive for. It makes me feel as if I'm a part of something bigger. My ears have become so attuned to the ocean that even above the surface I have become a focused listener. There is a deep silence while free-falling in the water column that cannot be found on land. The only sound underwater is the crackling, the consumption of decaying coral by polychromatic fish called parrotfish. Otherwise it is soothingly silent. I can't speak underwater; I can only listen. Matured by my marine experiences, in class I now speak more concisely, with clarity and purpose. On the football field I have become more relaxed and composed, and clearly focused on the game. The ocean has taught me patience. Every time I dive a reef, there is always that possibility of coming face to face with a large pelagic animal. On coral reefs I tend to find beauty in the smallest of creatures: dancer-shrimp, damselfish, and nudibranchs. But I make sure to look over my shoulder every minute or so for the chance to see something larger than myself. Occasionally I'll find a rock to sit on, and just look over the drop-off, waiting for a Manta Ray or a Whale Shark. I might be gifted with an appearance, but usually not. I have learned to appreciate the small things that I have, and wait patiently, and with hope, for those on a grander scale. The ocean has always been a didactic figure in my life. I can only begin to explain it; it's as if by osmosis the ocean's characteristics of being quiet, patient, and respectful, have blended into my identity. This defines me as a person—the ocean's effect on me—and motivates my desire to preserve the oceans. From a young age I've known what I have wanted to do with my life. I know Conservation International is correct when they say that nature doesn't need people; people need nature. So far the ocean has only taken care of me, and not the other way around. The ocean has given me a sense of what it means to be myself, and the freedom that goes with that. In return, I want to be its guardian, to protect it from destruction and help preserve its balanced, unforgiving beauty. - This was my college application essay from last year to the University of Miami where I now study Marine Science and Microbiology. I currently research coral-algal symbiosis and its implications under climate change; it is a dream come true. I hope you enjoyed reading my story!